The Festival of Broken Needles (Hari-Kuyo). 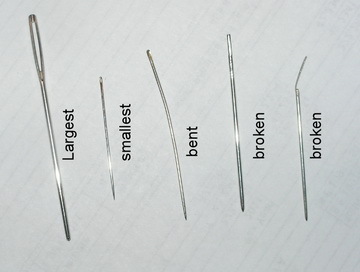 Today is The Festival of Broken Needles (Hari-Kuyo). I saved my needles from last Feb 8th to this Feb 8th had my own Festival of the Needles. Since I did not have tofo (not sweet enough for my needles) I used peach yogurt; figured I should give them a sweet send off since they had given me so much sweet stitching time. I counted them: 42 needles, didn’t realize I had stitched that many projects, but I changed needles every project and every month. I usually average about three needles a project. Of the 42 there were only two broken and one badly bent. 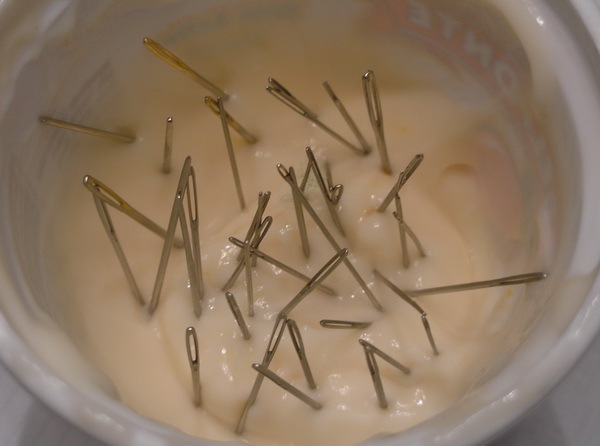 I also kept the largest and smallest needle, the bent or broken needles until last to place in the yogurt. I drank a Thai Chia latte and ate part of the peach yogurt to celebrate as I placed them in the yogurt. I had another post planned for this week and maybe I will get to it later this week. This entry was posted in etc, Holidays and tagged Festival of Broken Needles, Hari-Kuyo, needles. Bookmark the permalink. I must be a total oddball: I don’t throw away a needle unless it breaks, and that hasn’t happened in over three years. I am hard on needles; the eyes get out of shape; they bend and discolor. I just find it eaiser and safer to replace every project or when the eyes become mis-shaped or the needle bends.